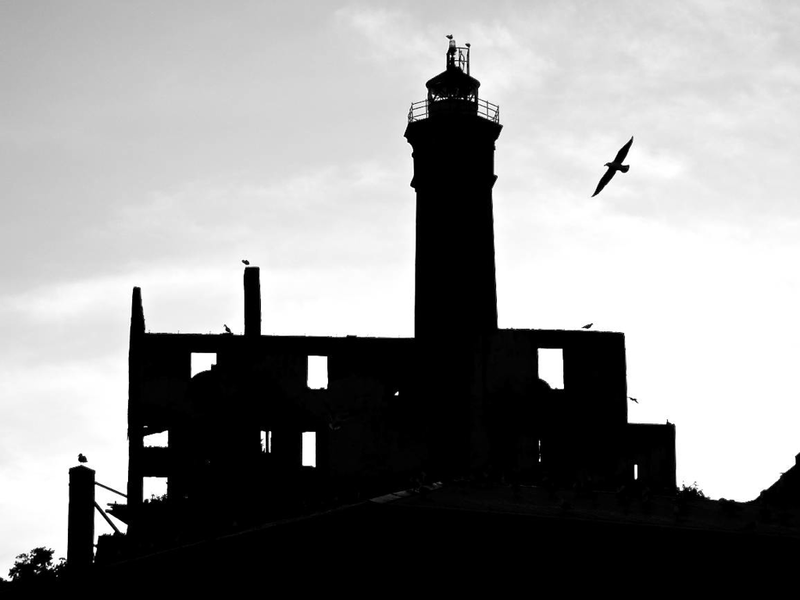 "Here's a black-and-white version of a photo I took of Alcatraz while playing tourist with my son during our recent visit to San Francisco for MacWorld," writes Darryl Esakof. "As the harbor cruise circled Alcatraz in the late afternoon with the sun low in the west, some very interesting silhouettes appeared." "Alcatraz by Darryl Esakof" Click on image for larger version. Darryl captured the shot with a Canon S95 , ISO 80, 22mm, f4.9, 1/800 sec., then processed it in Aperture 3. This is our 211th Grab Shot! Wow. If you want to review the collection that began back in 2006, go to our Grab Shots page. The Digital Story Podcast App is the best way to stream or download weekly TDS podcast episodes. No more syncing your iPhone, iPod Touch, iPad, or even your Android phone just to get a podcast. And the best part is, The Digital Story Podcast App is your way to help support this show. Download it today! A challenging aspect of image adjustment for many photographers is figuring out what needs to be done, then choosing the right controls to do it. The good news is, in iPhoto '11, you can let the application analyze the photo for you, have it make an initial set of corrections, then you can fine tune the picture's appearance to your taste. I call this the 3-Step Image Adjustment Technique. Step 1 - Choose your image in iPhoto, then click on the Edit button in the lower right corner of the application. Then click on the Adjust tab in the upper right corner. Take a look at the Histogram and get a feel for your image. For example, this image is lacking a bit in contrast. We can tell that by seeing that most of the data in the histogram is bunched up in the middle. You don't have to spend a lot of time on this, just a few seconds. We'll return to this view in a minute. 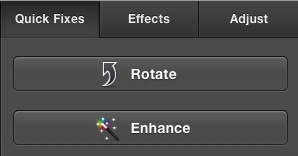 Step 2 - Click on the Quick Fixes tab, then click on the Enhance button. iPhoto will make a number of adjustments for you, based on its analysis of the image. You'll probably like most of what it does, but you may want to make a tweak or two. No problem. This is just a starting point that you can now fine tune. Step 3 - Return to the Adjustment tab. You'll notice that iPhoto has made a number of adjustments here. This is where you can fine tune. If you feel it made the photo too bright, move the Exposure slider to the left. 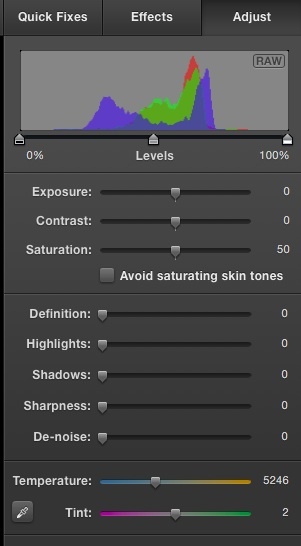 If the blacks in the image look too dark, move the Shadows slider to the right. 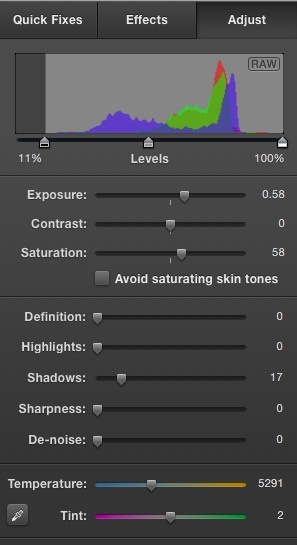 If the colors in the image are now too intense, check the box beneath the Saturation slider (labeled Avoid saturating skin tones) and play with the Saturation slider until you get the look you want. And finally, if you want to make the overall appearance of the image "cooler," move the Temperature slider to the left, and to make it warmer, move the slider to the right. Once I have the basic tones and colors the way I like, I usually add a little Definition (about 20-25) and a bit of Sharpness (15-25). Don't forget to crop if your image needs it. This entire workflow should only take a minute or two. And with practice, you'll get even faster. To see how much you've improved the picture, hold down the Shift key to see the original version. There will be quite a difference! There are more ways to learn and have more fun with iPhoto '11: my iPhoto '11 Essential Training ONLINE at Lynda.com, and the new iPhoto '11 Essential Training DVD that you can purchase from the Lynda.com Store for $49.95 US. You can get a feel for how this works by watching Creating Smart Albums in iPhoto '11. Want to learn Lightroom, Aperture, Photoshop, or practically any other major software title? The folks I teach for, lynda.com, offer a 7 Day Trial Period if you sign up. If, after the 7 days of mind-bending training, you decide that lynda.com isn't for you, then just cancel your membership with no obligation. My training titles on lynda.com include Aperture 3, iPhoto '11, Off-Camera Flash, Portraiture, Getting Pro Results from a Compact Camera, and more. Each title is presented to you in a series of short, digestible movies that you can watch over and over again until you master that particular technique. I organize the movies in a clear table of contents format, so you can go directly to the technique you're most interested in at the moment. If you want to watch the training from start to finish, then we keep the pace fast and informative helping you absorb as much information as possible. I have new titles coming out this year, including a revised Flickr training and a live-action training on how to improve your Group Shots. Stay tuned for those debuts. In the meantime, take a look at what lynda.com has to offer via the 7 Day Trial Period. It's really quite impressive. 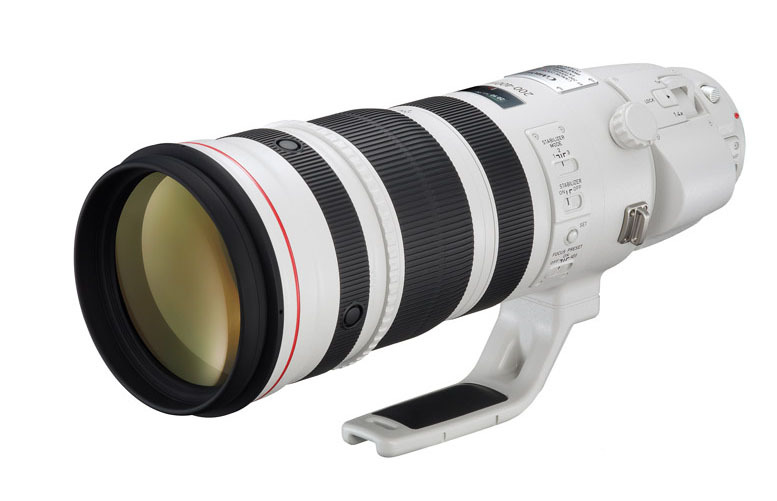 I stopped by the Canon booth at NANPA and chatted a bit with them about their announced Super-Telephoto Zoom Lens At The CP+ Event: The EF 200-400mm f/4L IS USM Extender 1.4x Lens. I was hoping that there might be some new news since Canon officially spilled the beans in February. When I stopped by, there was no one else around... just in case. But sadly, there was no news about the super zoom that will have a 1.4x tele extender built-in that can be switched on and off. Other than, Canon said it was the most-asked question at the Nature Photography Summit. Bottom line, still no official word on release date, on estimated price, or on how the built-in tele extender might actually work. If you're interested in learning more about the EF 200-400mm, there's a pretty good article about it on The-Digital-Picture.com. 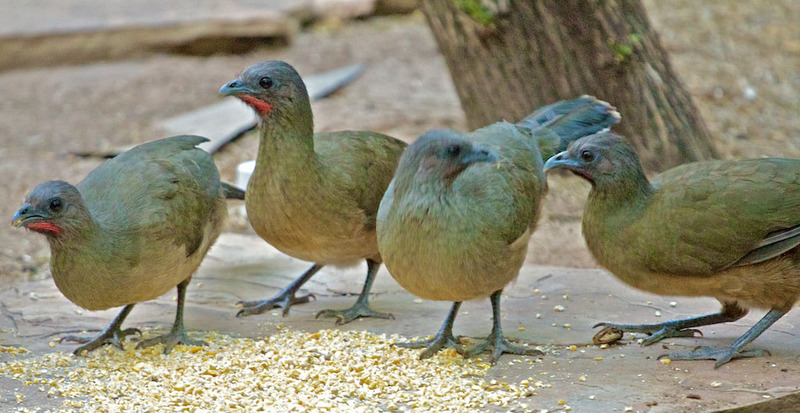 They might not be the prettiest bird you've ever seen, but the Chachalaca in Southern Texas make up for it in personality. Chachalaca feeding after chasing off a rabbit. Click on image for larger version. They are fairly big, about 22" in length. I watched one chase-off a Cottontail rabbit this afternoon at the Mazatlan World Birding Center in McAllen, Texas. You can't miss their call once you've heard it: cha cha lac, cha cha lac! And it's so loud that you can't hardly hear anything else. After just two days in the Rio Grande area, I can tell you already, if you're in to birding, this is an exciting place. In addition to the group of the facilities that comprise the World Birding Center (think of it as the Smithsonian of feathered creatures), there are also private ranches that have converted to conservatories for local habitats. One example is the Santa Clara Ranch that features 300 acres preserved Southern Texas landscape, photo blinds, ponds, and feeders where photographers can capture a variety of birds and wildlife. They even have bunk houses that you can rent for extended stays. Since about 90 percent of the land in Texas is privately owned, this is a positive trend seeing ranch owners becoming conservationists, and making a living while doing so. If you love wildlife photography, it would be worth your time to investigate the opportunites in Southern Texas. Glossy Ibis, originally uploaded by The Digital Story. 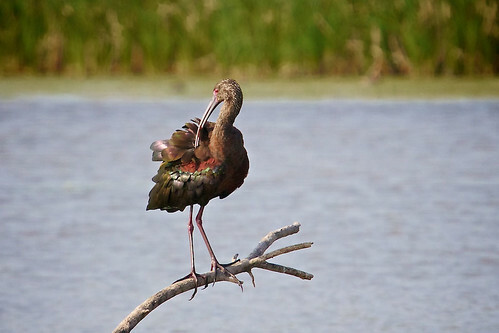 Once the morning light broke through the clouds at Estero Llano Grande State Park outside of McAllen Texas, everything came to life, including the plumage on this Glossy Ibis who was preening. Image captured with a Canon 60D, Canon 1.4X tele-extender II, and Canon 70-200 f/4 L lens. I use the tripod collar for the zoom, then attach the rig to a monopod to steady the shot since the magnification is increased. ISO 200, 1/500th at f/8. You can see more images from this shoot on The TDS Flickr page. McAllen Texas is a changing city. I spent a couple hours this evening hanging out at the new convention center that has become a community area for locals. I saw a wedding party taking photos, families relaxing on the green, couples portraits, children playing, and people just enjoying the balmy breeze at twilight. Portrait at Dusk -- Captured with a Canon S90, ISO 1000, 1/20th at f/3.5. Photo by Derrick Story. Click on image for larger version. I asked a few locals about the reported border violence. "Yes, there are certainly areas you must avoid," said one. "Down by the river there are encampments and lots of guns." But there was none of that tonight in the convention area that featured beautiful grounds, restaurants, and shops now open for business. 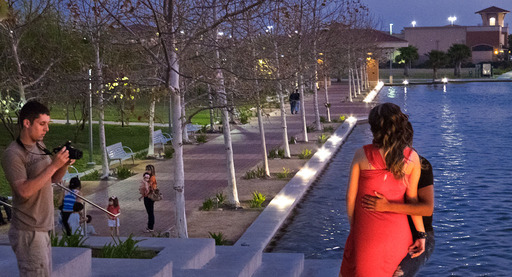 No one seemed happier about this, than a young couple, posing for a portrait in front of an illuminated fountain as the sun dipped below the horizon. Lots to cover this week, and I'll touch on as much of this as possible: iPad 2, Flash Benders portable light modifiers, Samsung NX 100 ILC camera, Nature Photography Summit in McAllen Texas, "What's in my Bag?" and TDS Podcast App hiccups. Thanks for tuning in and being a part of our virtual camera club. Oh, and I also announce the latest "SizzlPix Pick of the Month." You can also download the podcast here (32 minutes). Or better yet, subscribe to the podcast in iTunes. You can support this podcast by purchasing the TDS iPhone App for only $2.99 from the Apple App Store. Soon, you'll be hearing about the going-ons at the Nature Photography Summit in McAllen, Texas. This should be an interesting trip for a variety of reasons. At first, McAllen might seem like an unusual choice for this event. It's only a few miles from the US/Mexico border in the Rio Grande Valley. There's enough questionable activity that I've been advised not to go out at night by myself. Hmmm, Las Vegas this isn't. But this area does support abundant wildlife, including the World Birding Center. So there won't be night shooting during this adventure, rather wildlife photography during the day. Plus, there's the conference itself at the McAllen Convention Center. So stay tuned. I have a feeling there will be some interesting reports coming from Southern Texas.